We are excited to announce that Wright State senior Channiel Haizel-Cobbina will be interning at Project Turnstile for Summer 2018. An Industrial and Systems Engineering Major, Channiel will oversee all aspects of the jobsite administration at Project Turnstile, including securing all required construction permits and other documents needed to remain in compliance, creating and reviewing project schedules, and completing and following up on change orders and RFI requests. Channiel will also meet weekly with the project superintendent to review project needs and work on special tasks related to the team. 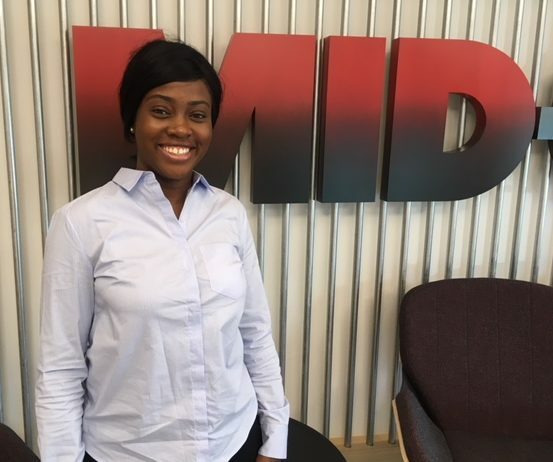 Working onsite will give Channiel an overview of the construction process, while still providing her practical experience and understanding of what is required from day-to-day to manage a large construction project, Ryan Dew, Director of Human Resources, said. She’ll work closely with Scott Curry, superintendent, who will be a great resource for her. Channiel is from Canal Winchester and graduated high school from Westerville South. She became interested in industrial and systems engineering after taking a course in bioelectronics at Wright State. I was really interested in DC and AC adapters. I immediately loved what I was studying and knew that this was for me, Channiel said. Lately, Channiel’s interests have been leading her to construction. The process and lifecycle of a construction job, and problem-solving to find real-life solutions to benefit a project have piqued her interest. Following Channiel’s internship, she will complete her senior year at Wright State University in Dayton, Ohio. She will graduate in Spring 2019. Are you interested in pursuing a career in construction and in need of an internship? If so, contact Ryan Dew at rdew@mc.aheliotech.com.